Judith of Anchorage, Alaska submitted this recipe which was a winner in our Italian recipe contest judged by Mary Ann Esposito of Ciao Italia. Preheat oven to 350. Slice the peppers in half lengthwise, including the stem. Scrape out the seeds (I like to use a grapefruit spoon). Leave a few seeds in if you like your food spicy. Mix all the other ingredients together making sure it is well saturated, but not swimming in oil. 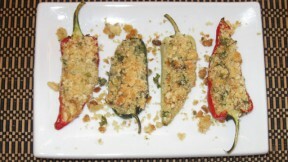 Stuff the peppers with the bread crumb mixture using a spoon. Pat down lightly. Place the peppers in a greased baking pan (Pyrex) and cover with tin foil. Bake for 30 minutes. Remove foil and check peppers for tenderness. Bake 8-10 more minutes if needed. Serve on a platter heated or room temp.